The former Ukrainian Prime Minister was released from prison last week and will join two other political figures for the EPP conference. 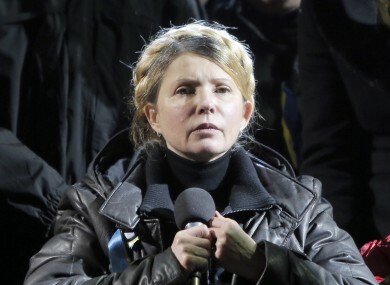 UKRAINE’S YULIA TYMOSHENKO is among the visitors who will speak at a European elections event in Ireland this weekend. It was confirmed today that the opposition leader will join her country’s newly-elected prime minister Arseniy Yatsenyuk and opposition figure Vitali Klitschko at the European People’s Party conference in the capital. Approximately 2,000 participants from 39 countries will take part in the Dublin congress, which takes place on Thursday and Friday of this week, 6-7 March at the Convention Centre on Dublin’s Spencer Dock. At the event, which is hosted by EPP member party Fine Gael, the EPP is due to elect its candidate for President of the European Commission. Speculation began last November that Taoiseach Enda Kenny was “being seriously talked about” for the job. The role has been held by Jose Manuel Barroso since 2004 and will become vacant this June. The event will be hosted by the Taoiseach and by EPP President Joseph Daul and the EPP electoral programme is due to be discussed at the congress. Speakers at the event will include Fine Gael TD Charlie Flanagan (Ireland), Jose Manuel Barroso (President of the European Commission), Angela Merkel (German Chancellor), and Herman Van Rompuy (President of the European Council). Email “Tymoshenko and Ukraine's new prime minister to visit Ireland this weekend”. Feedback on “Tymoshenko and Ukraine's new prime minister to visit Ireland this weekend”.